The disturbing yet addictive site tellmewhereonearth.com outdid itself with this listing for a kangaroo scrotum, being sold for a mere $19.99. Sorry Peta! This is one of those products that reminds me yet again of how weird humans are. “Once upon a time there lived in the center of Australia an aboriginal boy. One day he came upon a small kangaroo in the bush, caught it by the tail, and made a purse out of its dear little symbol of masculinity. He gave it to his girl, and she kept seeds and berries in it. Next he saw a large kangaroo. He caught it with a spear and made another purse from its thick symbol of masculinity. He gave it to his father who kept stones and things of value in it. 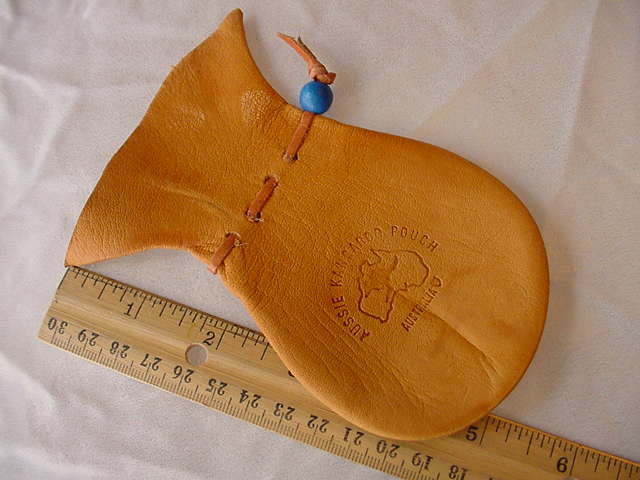 "Ever since then, male kangaroo scrotum purses have been popular amongst the aborigines. For women, the soft pliable one; for men, the strong, wrinkled one. They became as important as one's own symbol of masculinity and were recognized as bringing luck. That's why kangaroo scrotum purses are called 'Lucky Bags' or 'Lucky Pouches'." Sorry guys, but this thing is so widespread, Playgirl had to have a piece.